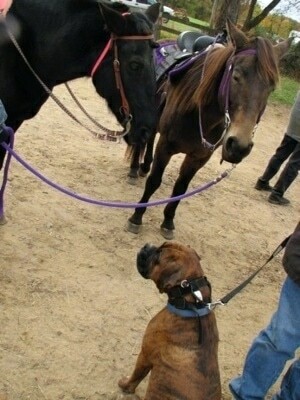 A day in the life with Bruno the Boxer. 1 year, 6 months—88 pounds, 24 1/2 inches from the ground to the highest point of the shoulders (the withers). 1 year, 6 month old (18 months). Happy Halloween, Bruno! 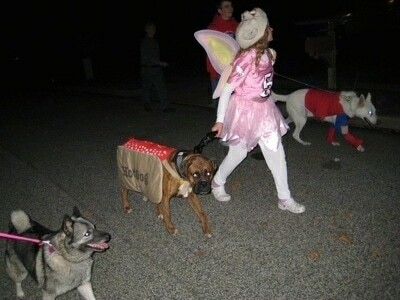 Bruno and Tia walk along with us on Halloween. He was such a good boy. Nothing fazed him. Not the kids who were all dressed up, not the people everywhere. 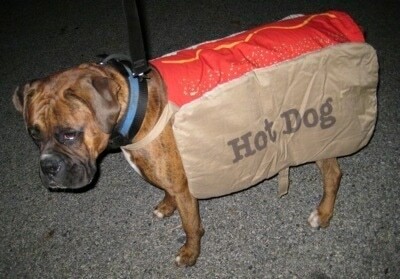 Not even the guy dragging a cooler of rattling drinks across the street or his hot dog costume. We walked the dogs on the sidewalk as the kids ran up to each house. As we approached each house I would give Bruno the "Wait" command and he would stop and wait until I started walking again. 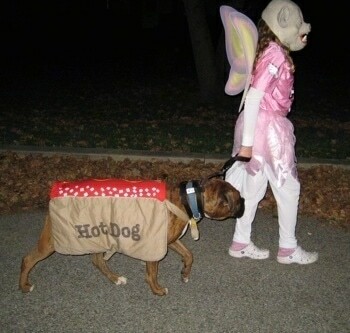 Bruno walking with Sara who was dressed as a flying pig, inspired by the saying "When pigs fly!" A few days before Halloween Sara had come into the kitchen with her pig mask on and Bruno had jumped back, not sure what it was. I told Sara to take the mask off and let him smell it then put it back on. She did just that and Bruno realized the mask was simply part of Sara. He was no longer afraid of it. Bruno is so content walking beside humans. If he starts walking a little too fast I only need to very lightly touch this back end with my foot or very lightly give the lead a tug. VERY lightly, because he is so responsive. It's as if we are giving him a small reminder and he is saying, "OK, I'll slow down." He has no desire to be in front. None at all. He's very happy to just follow. 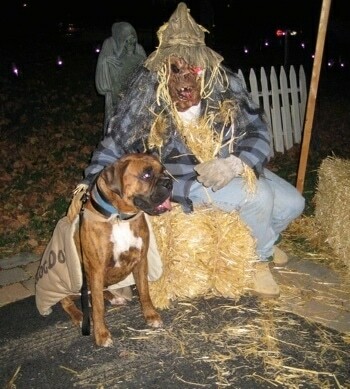 Bruno sitting with one of the monsters whose job was to scare the little kids as they walked by. Not even the monster fazed him. Bruno goes to a rodeo. The entire day Bruno simply followed whoever had a hold of his lead with no desire to pull ahead, no desire to go anywhere else. He simply followed without any verbal commands. All day long people were commenting on how well behaved he was. Not even the horses speeding past in the events fazed him. He would duck his head under the fence so he could watch, but he never flinched, never had any desire to go in the ring; he simply waited with his human leaders. 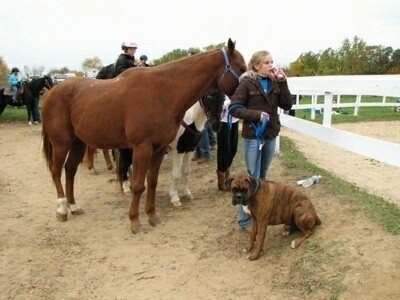 Bruno chilling with the horses. Watch out, Bruno! 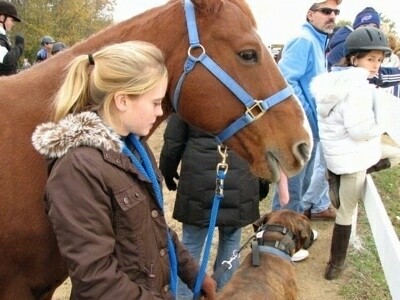 The tongue, the tongue! Paybacks from Jack the horse! A few minutes before this picture was snapped Bruno had looked up at Jack the horse and given him a big lick on the mouth. Jack didn't seem to enjoy his doggie kiss all that much. 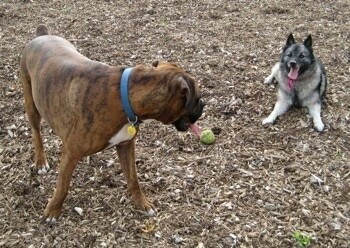 Twice a week Bruno still goes for an hour-and-a-half walk with Tia the Norwegian Elkhound. 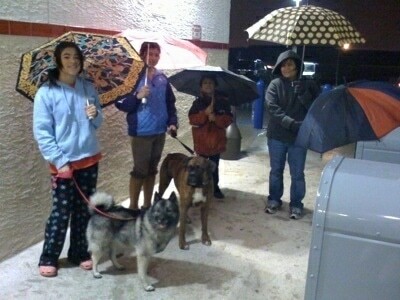 It was a windy, rainy day, but the dogs didn't mind one bit. Tia's owners state she is very calm and well behaved inside the house, the polar opposite from the first day she was rescued from the pound. Bruno finally met his match. 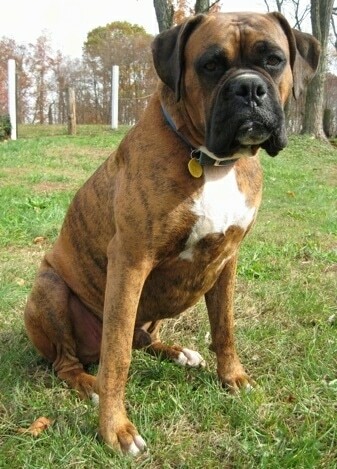 It would always seem Bruno and his Boxer style of play, pawing and jumping around like a crazy pup with all that weight behind him, that he would dominate the play sessions. 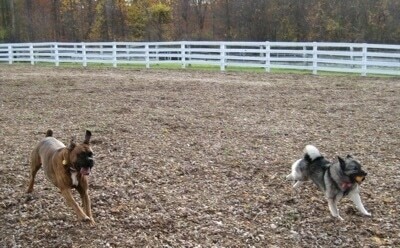 Then here comes Tia the Norwegian Elkhound. Because she is smaller than Bruno she can practically walk underneath him like she’s going under a bridge. Makes it hard for Bruno to jump on her when she's UNDER him biting at his legs and barking. Tia enjoyed picking up a tennis ball and running with it. Bruno was not able to catch her. She also picked up tree branches and ran with them. Same deal, Bruno could not keep up. She would get down in a play position daring him to come at her. Then she would bark and run! Tired of chasing, Bruno decided to plop on the ground. 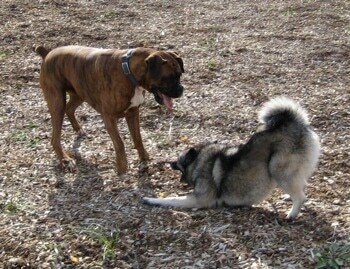 See clips of Bruno and Tia playing on YouTube, username: dogbreedinfo.